CNBC has learned that Amazon is hauling some cargo in self-driving trucks from Embark. 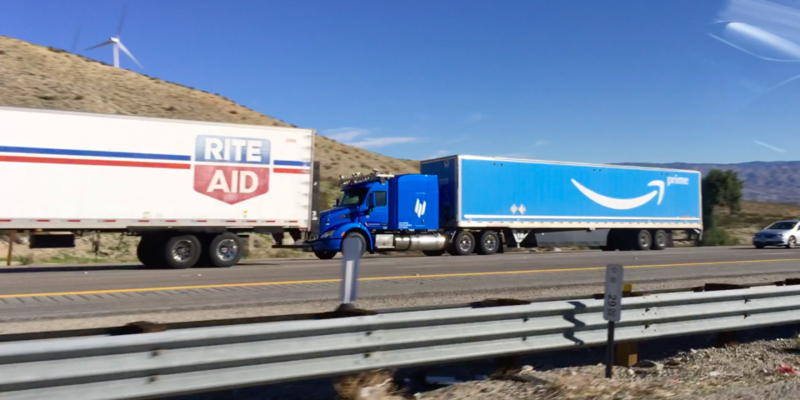 Photographs of trucks with both companies’ logos are posted on Reddit. Embark and other firms working on autonomous systems aim to alleviate industry pains by making existing truck drivers safer and more efficient. Amazon is using self-driving trucks developed by Embark to haul some cargo on the I-10 interstate highway, CNBC has learned. The trucks were previously noticed by a Reddit user, who photographed and shared images this week showing tractors emblazoned with the Embark logo and trailers painted with the Amazon Prime logo. Embark integrates its self-driving systems into Peterbilt semis, rather than building its own vehicles completely from scratch. Generally, Embark trucks operate on roads with test drivers on board. Embark and other firms working on autonomous systems — including fellow start-ups such as Ike, Thor Trucks and Pronto.ai, and major players such as Alphabet‘s Waymo and Tesla — aim to alleviate industry pains by making existing truck drivers safer and more efficient. A driver shortage currently plagues the trucking industry, owing in part to the low pay and difficult schedules and conditions of the job. A lack of available drivers and trucks poses a challenge to e-commerce companies, obviously including Amazon, whose customers expect deliveries in a relatively short time. CNBC asked both companies for further details about how they work together, but both declined to comment specifically on the deal. Expect to see more autonomous trucks in circulation in the U.S. soon. In October 2018, the National Highway Transportation Safety Administration issued its updated AV3.0 policy, which has helped autonomous vehicle firms such as Embark figure out how to test their technology before driving on public roads and which rules they need to comply with to stay there. Founded in 2016, Embark has raised at least $47 million in venture funding from firms including Sequoia Capital, Data Collective, Y Combinator and AME Cloud Ventures.